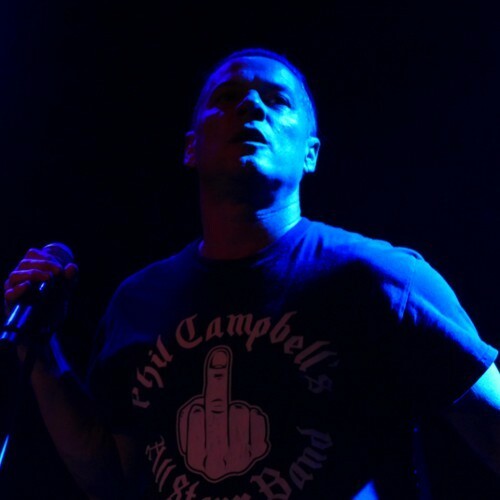 An unorthodox acoustic covers/stand-up comedy routine support band is explained by the fact that Ugly Kid Joe were support act Tim McMillan's favorite band as a kid when he wrote a book report about UKJ guitarist Klaus Eichstadt. It is difficult to see how he would have got the slot otherwise, his use of the microphone and drum kit/cymbals behind him as syncopation is mildly entertaining. His off-colour stories about his mum, dead goats and homeless people allowing billionaires to "piss" in their mouths for money are remarkable well received by the crowd, given they were more bizarre than clever and seem to consistently lack a funny punchline. A good party trick of completely spinning around his acoustic guitar in a full rotation forwards without missing the next stanza of a song is impressive, but we were unsure as to any longstanding appeal factor of his act which is a bit "niche". Fortunately, UKJ come along fairly swiftly, bursting onto the stage with old MTV hit 'Neighbour'. The band have come a long way (as demonstrated by their last album) from the beach brats of the early nineties and they are heavier live than on record. They are still uncomfortably anti-social (or comfortably depending on your perspective), viz Whitfield Crane constantly spitting on stage, the drummer mostly naked except for underwear highlighting his private parts and the subversive wearing of a Justin Bieber t-shirt by Eichstadt. 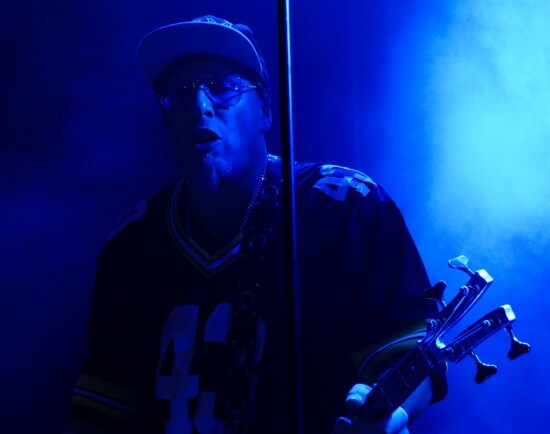 However, leaving all of that aside, the band come across as a professional Hard Rock outfit and we were reminded of the Red Hot Chili Peppers more than once, especially due deep, energetic knee bends and Funky bass lines courtesy of Cordell Crockett. Crane seems genuinely moved by the enthusiastic reaction of the audience, he turns to the band and asks what day is it and if it's really a Wednesday. The crowd enthusiastically make noise when he leans towards them on cue and wiggle their fingers high in the air as well as clap and sway on cue. The smell of skunk is thick in the air and there's no doubt it's a party crowd. When a security guard tries to keep order, Crane remonstrates with him and then urges the crowd to rush the barrier and pogo to become "one musical organism"... which they do, but since the average crowd age is at least thirty nothing actually gets out of hand. 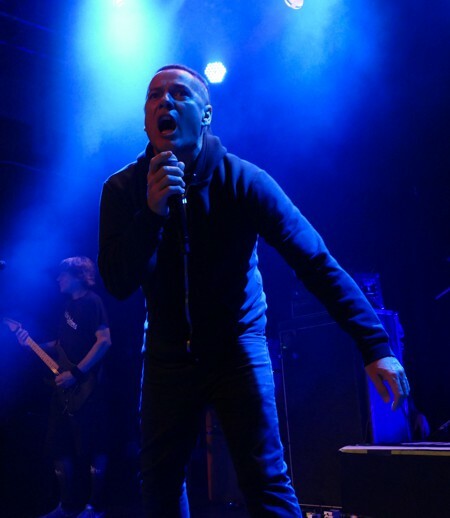 Crane gets a chance to please and show off his vocal prowess on 'Devil's Paradise' and in an encore acoustic interlude with support artist McMillan when lesser played UKJ songs get an airing to a delighted crowd. UKJ also provide a version of 'Waterloo Sunset' by The Kinks via their English guitarist to encourage a local connection, even though Crane claims never to have heard it before, being a fan of Black Sabbath, Judas Priest, Van Halen and Lynyrd Skynyrd. They do requests including 'Mr Record Man' which Eichstadt sings from lyrics held up by the drummer in his underpants. Despite all the nonsense, UKJ are now a serious Hard Rock band with Funk, Rap, Grunge and Blues elements and gave a seasoned performance tonight, showing they've got chops and are by no means a novelty one-hit wonder. There are even some Metallica-esque heavy riffs and death growls as a nod to more recent Metal developments and an energetic version of 'Ace Of Spades'. Rather than a necessity, everybody is hanging on for finale 'Everything About You' which is more like a cherry on the cake. UKJ's performance tonight was varied, never boring and if the last song had not been played everyone still would have said it was a great show. That's no doubt testament to how far the band have come since they all wore shorts!